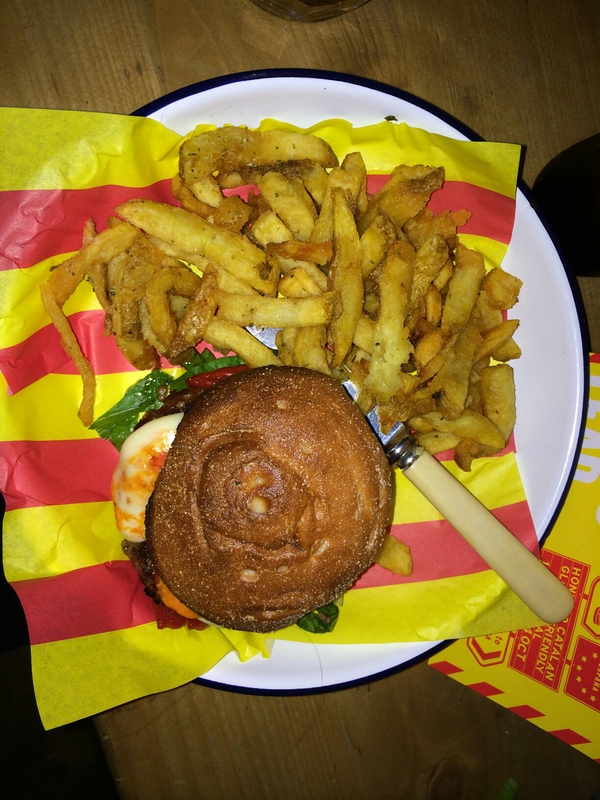 I love Honest Burgers, the fantastic London collective of burger joints serving delicious gluten free burgers ( see my previous review here). Their simple menu, simple restaurants, fantastic service and excellent food make them a firm favourite amongst all Londoner’s, but they have a special place in the hearts of Coeliacs. The fact they are listening to their customers and have executed a gluten free menu so well are rewarded with their firm following of gluten free fans, from London and afar. I’m no different, excited by having a burger in *an actual bun* with delicious rosemary salted fries and onion rings- yes, you read that right. 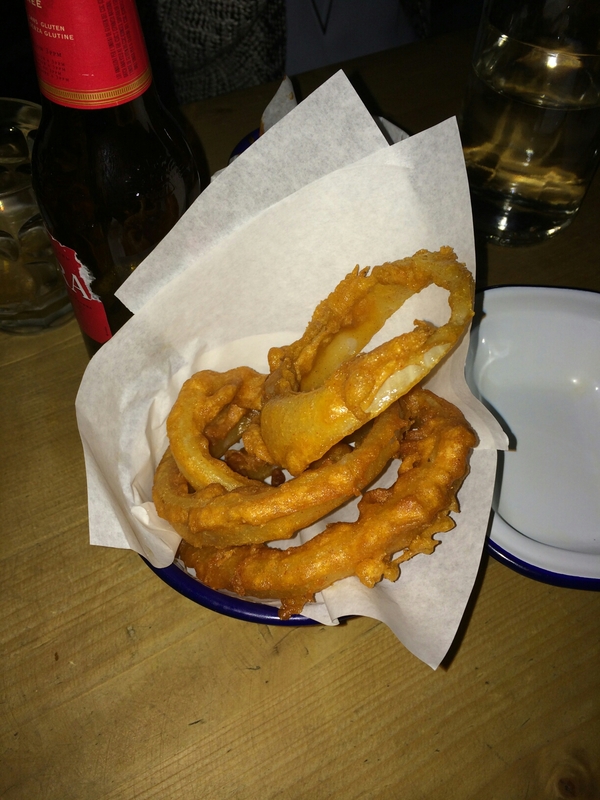 Gluten free ONION RINGS! So when I received an email whilst sunning myself in Ibiza, asking me to attend the launch of their new special burger, it gave me something to look forward to on my return to dreary England. I jumped at the chance and added my name to the guest list. 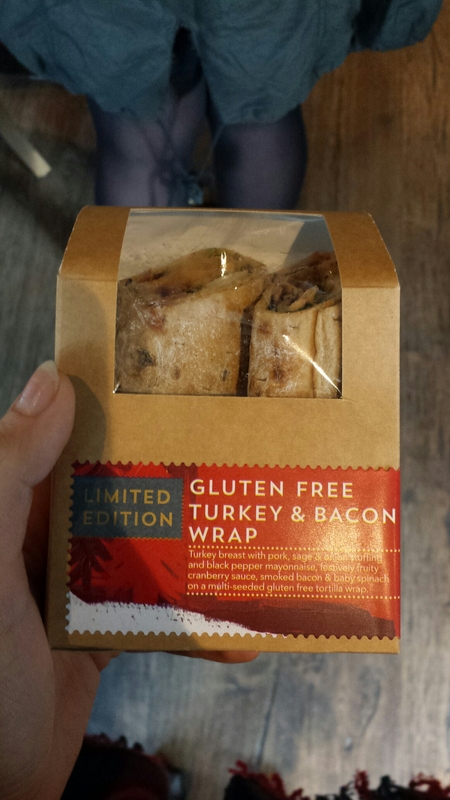 As with many London gluten free launches, it turned into a little Tweet Up! I was joined by the lovely Florence, Kim, Kelly, Carly, Sian, David and Alison. It’s always lovely to see them and impromptu meet ups are even better! As soon as I was seated I was kindly offered a beer- this being the gluten free Estrella Daura. Now I have to admit that my taste for beer has diminished since diagnosis, to the point that even if a GF beer is available, I’ll probably choose cider. 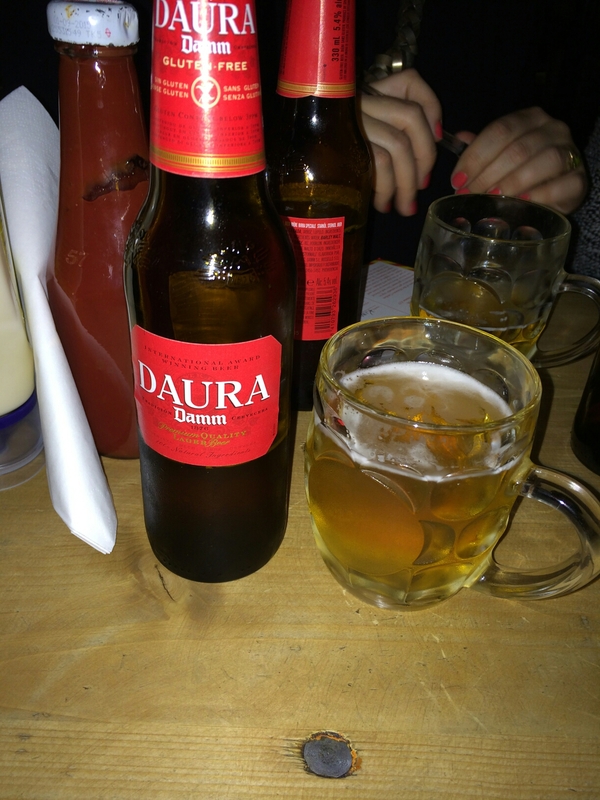 That being said, I did enjoy my bottle of Daura and recommend it to any Coeliacs who miss beer! 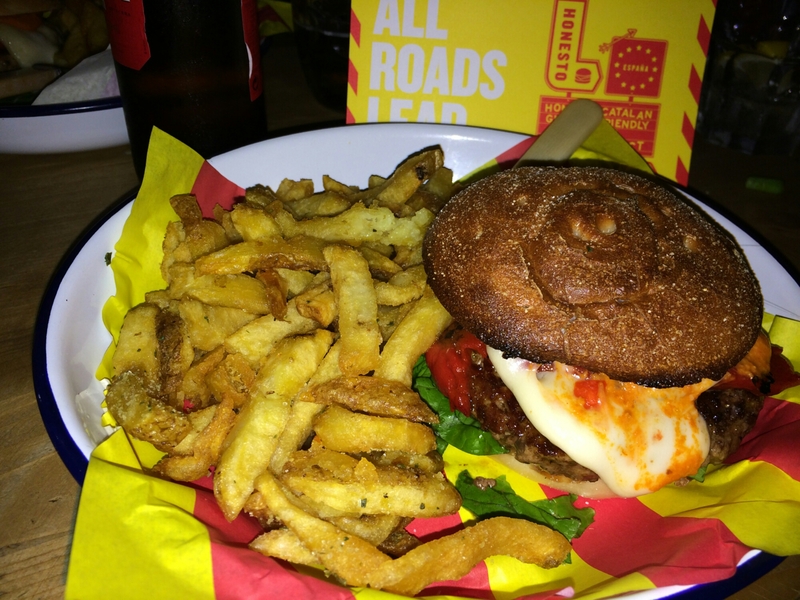 Daura are collaborating with Honest Burgers to ensure Coeliacs can enjoy two of their favourite things together…. beer and a burger! 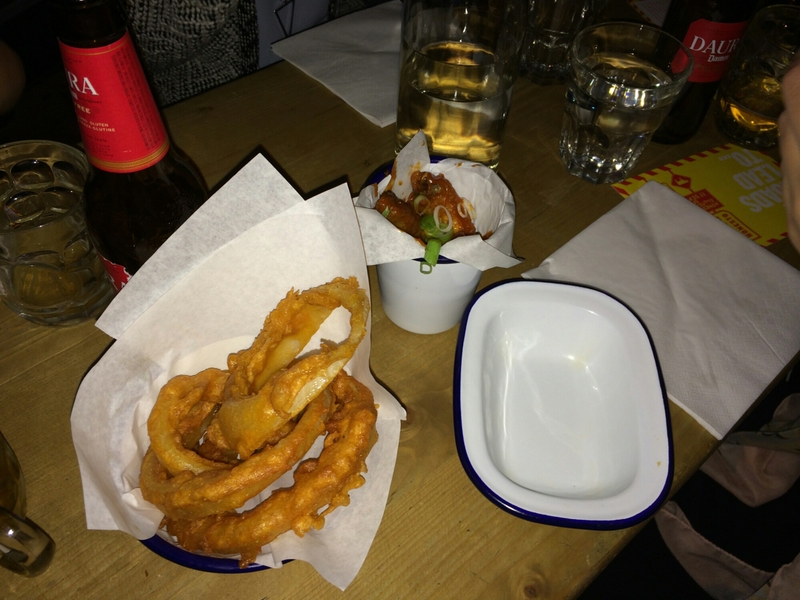 We were then presented with a bowl of onion rings and chicken wings to try I’m in love with their onion rings (previously these were made from red onion, which I actually preferred. The ‘normal’ versions are damn good too though! 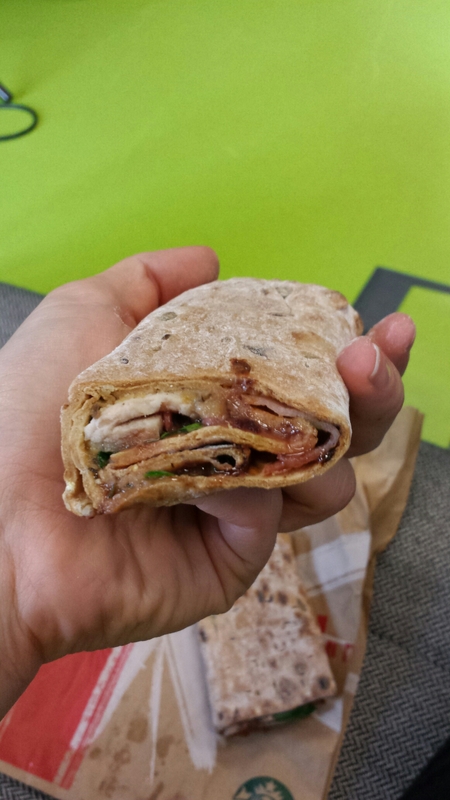 ), it’s so nice to be able to have them and they’re perfectly crispy….to be honest I didn’t want to share! I don’t eat meat on the bone so I wasn’t overly impressed with the wings ( I did try one but barely touched it before I got to the bone…ewww) but I can say they are tender and spicy! A little while later we were given some information on the special burger and the ingredients and placed our order, excited to try the combination of flavours. As part of their collaboration with Estrella Daura, a Spanish brand, Honest have created a burger full of Spanish ingredients; beef, crispy lomo ham, GF romesco sauce, tetilla cheese & grilled red peppers. Romesco sauce, as Honest Burgers creator extraordinaire Tom explained, is normally made using breadcrumbs and therefore is unsuitable for Coeliacs, however they’ve spent time crafting a gluten free recipe so that we can all enjoy it too! The burger itself was cooked as perfectly as always. Mine was a little more pink than I had asked for but I fully enjoyed it still. One suggestion made by Kim that I completely agree with is that the lettuce shouldn’t be on the bottom because it causes the burger to slip out of the bun. A few of us also struggled to notice the lomo ham, but after having a chat with Tom we agreed it was most likely down to the positioning that perhaps caused it’s lovely taste to be lost. The romesco sauce is gorgeous but definitely makes for messy eating! 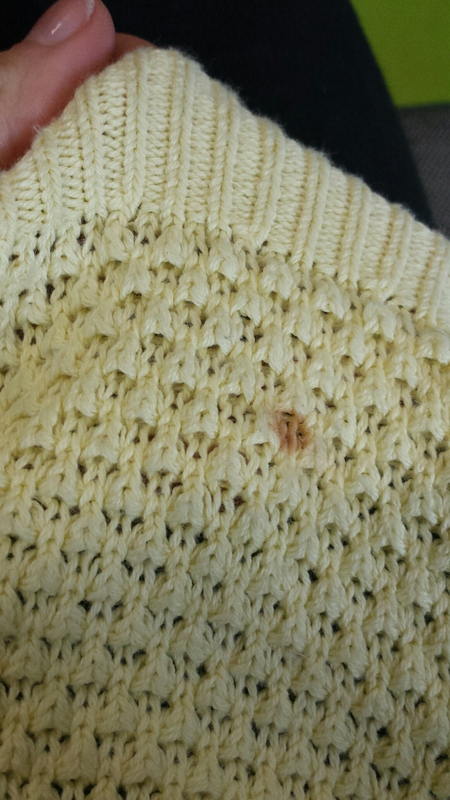 I think I had most of it dripping down my wrist, so be prepared! All part of the experience though…. The buns they use are by Antoinette Savill, a product that was previously sold in Waitrose stores. I think the buns are great as they don’t crumble to pieces in your hand as you’re eating! The chips, as always taste fantastic, the mix of the salt and rosemary working really well together. This special burger will be available until 17th October at King’s Cross. If you’re in the vicinity, I highly recommend you pop in and sample one for yourself….don’t forget the beer! A big thank you to Tom and the team for a fantastic evening and for the offer to sample the burgers. Back in February I met up with Kevin from Gluten Free by The Sea and his lovely wife Abby in London, for a yummy gluten free dinner before us two ladies headed off to see Taylor Swift (which, by the way, was amazing!). Anyone who knows Kevin will know how much he loves Honest Burgers, and since I’ve never been we decided to go there. It was a decision well made. 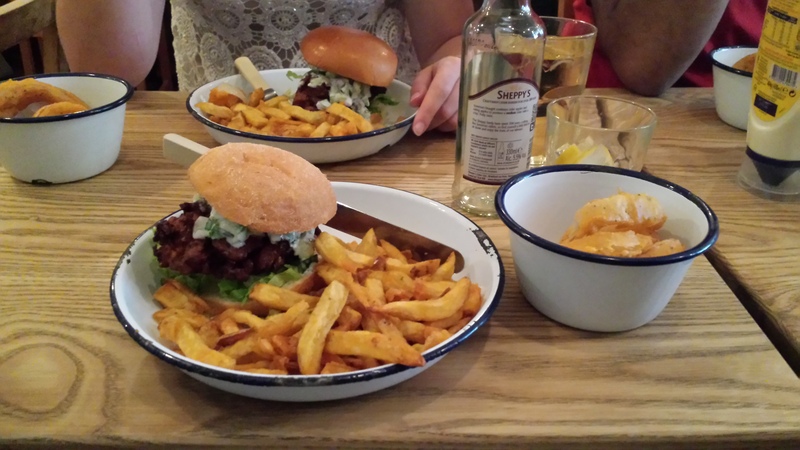 Honest Burgers isn’t a completely gluten free restaurant, but all of their burgers, including the vegetarian fritter, are gluten free and are served with delicious buns. Their chips are cooked separately to anything else and even the onion rings (made with red onion, so delicious) are gluten free, such a novelty for Coeliacs! I’m not a massive fan of meat and loved that I could actually have a vegetarian burger here so I chose the vegetable fritter, made with cauliflower, sweetcorn, shallots, spices, coriander and served with a cucumber yoghurt. 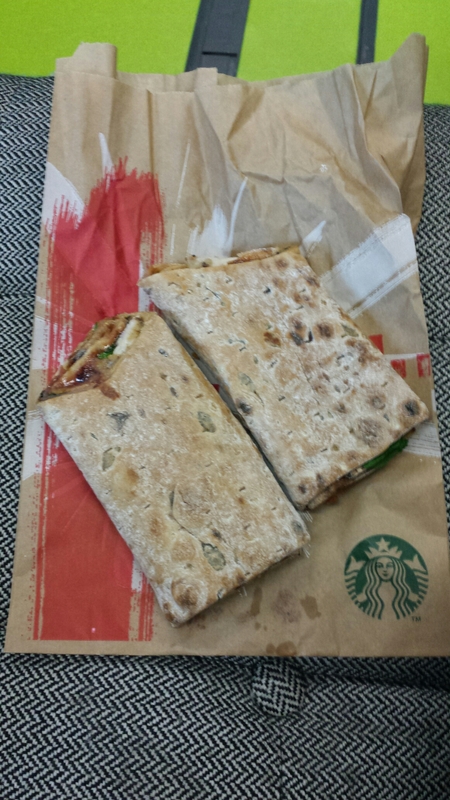 Granted this probably isn’t as delicious as a beef burger but I loved every bite! The bun, which comes from the WAG bakery was equally good and didn’t fall apart the minute you touched it. The chips are quite possibly the BEST I’ve ever had and I can’t say how happy I was to be able to enjoy onion rings again! They even have gluten free Estrella Daura gluten free beer available if you fancy it. My fritter (vegetarian option) burger with the rosemary salted fries and the glorious gluten free red onion rings! Two things to note about their restaurants- they’re quite small and they don’t take bookings, so be aware that you may need to put your name down and wait for a table during their busier times. They also sometimes have specials which contain gluten- whilst they take care to avoid cross contamination, there’s still a risk so it’s up to you whether you’re comfortable or not. I’d suggest checking their Twitter page or phoning ahead to find out what’s on. I strongly recommend that any visitors to London visit one of their restaurants- you can choose between Soho, Brixton, Camden, Portobello, Kings Cross and Oxford Circus. You won’t be disappointed! Last weekend I dragged my boyfriend and two friends to the Soho restaurant after a day at Notting Hill Carnival. I was desperate to get myself back there and having mentioned burgers, my friends were equally keen. One is actually a vegetarian and really enjoyed the veggie fritter, which we both had. Great service and food once more, so thank you! As we paid the bill we asked the waitress if she could recommend any dessert places nearby, as we were all craving something sweet. She mentioned a Gelato place just round the corner, so we headed along with our mouths watering, to Snowflake. Straight away we noticed the vegetarian signage for my friend which was great, but I had to question the staff regarding gluten free. I was advised that all sorbets are safe and the same with the gelato, however closer inspection showed that some gelato’s had biscuit in them! They do however have a wheat symbol on the label, so they are marked up but clearly the staff need a little more training. I was impressed to be pointed in the direction of a tub of cones on top of the counter, all marked ‘Senza Glutine’. YAY! Promptly I ordered a single scoop gluten free cone topped with a chocolate and hazelnut gelato. So, if you’re heading into Soho for a quick Honest Burger, then definitely head just round the corner into Wardour Street for your gluten free dessert.